Mexican cuisine is a mix of indigenous Mesoamerican cooking with European, especially Spanish, elements added after the Spanish conquest of the Aztec Empire in the 16th century. The basic food ingredients remain the same, or what is native to the culture, such as corn, beans and chili peppers, but the Europeans introduced a large number of other foods, which were meat from domesticated animals (beef, pork, chicken, goat and sheep), dairy products (especially cheese) and various herbs and spices. With the introduction of the chicken, came the egg and in turn the modern day breakfast that is called Huevos divorciados, which is Spanish for divorced eggs. It’s a breakfast mostly found in Mexico City and features two fried eggs separated by a column of refried beans. In some homes of Mexico they will replace the beans with chilaquiles. 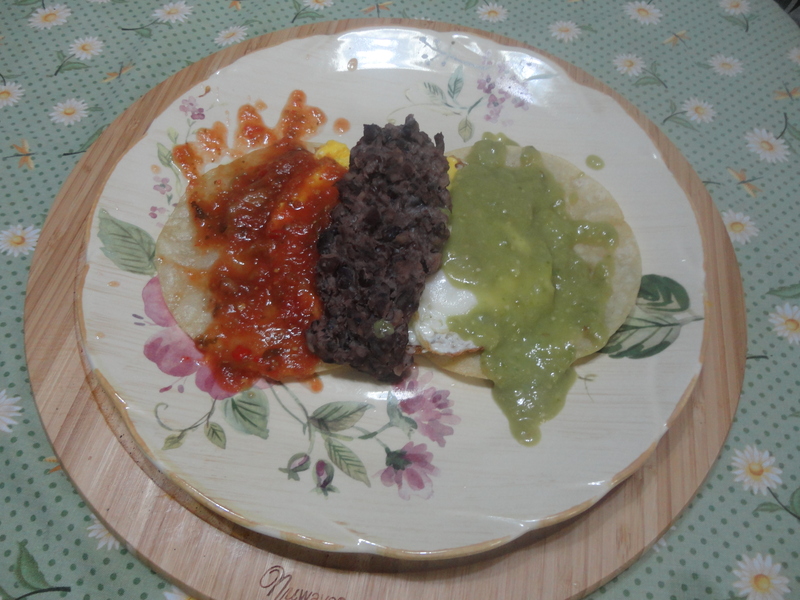 Typically, one egg is covered in salsa roja or red salsa, while the other is covered in salsa verde or green salsa. Place a small frying pan on medium high and heat oil. With a pair of cooking tongs dip tortillas one at a time to fry, but not crisp; about 1 to 1 ½ minutes. Allow oil to drip off and place onto plate. Allow tortillas to overlap each other. Remove all but a small amount of oil from pan. Return pan to heat and crack both eggs into pan. Place lid over eggs and cook sunny side up style; about 2 to 3 minutes. Turn eggs onto tortillas, making sure egg is lying in center. Next spoon beans over top of eggs, also centering the beans over the eggs. On one side of the beans, spoon on the red salsa. Next spoon the green salsa on the other side. Recipe is for 1 swerving. Follow the instructions doubling ingredients to serve 2. This entry was posted in Breakfast and tagged corn tortillas, Fried egg, Green sauce, Huevos divorciados, Huevos Rancheros, Mexican cuisine, Mexico, Mexico City, refried beans, Salsa, Taco Bell, Tortilla. Bookmark the permalink. I am a fan of eggs with Mexican flavors. Recipe looks delicious. Thanks for stopping by and commenting! !